So much is happening in the surrounds of the house that I will try and record just some of it here. There are too many spiders to introduce them all, but that won't stop me trying. Clicking on the images will enlarge them. The most dramatic are the garden orb weavers (Eriophora biapicata, family Araneidae). I have two just outside the back door who are making sizable webs already. This is Regal, named such because she is located among the regal pelargonioums. She isn't making proper orb webs, constrained by the many branches of the shrub around her. I pruned a bit yesterday to try and help. 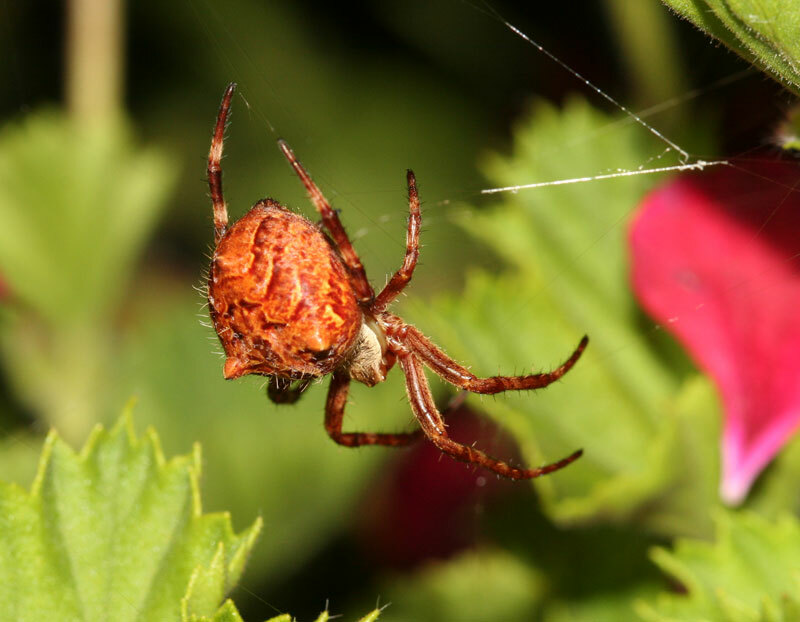 Any location with a spider becomes sacred ground - pruning, digging, walking - they're all limited to minimize the impact on the resident arachnid. Garden orb weavers will change colours according to their surroundings, so they vary enormously, which makes them visually stunning companions. Regal rests on dried leaves in her bush and is almost impossible to see there without searching for the leg which will be monitoring the web - just keeping in touch (literally) with her hunting grounds. I have at least three species of wolf spider (family Lycosidae), some are free range hunters, but the large burrowers are the ones I get to know as individuals - Lycosa godeffroyi. There are two, one in each of the vegetable gardens, who have their domains fenced off, and we garden around them. Cucumber (named after the crop her bed held last year) is as cool as her name. 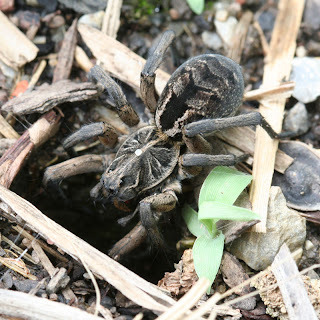 She will sit out sunning herself, as wolf spiders love to do, even as we garden around her. She is extraordinarily confident. Only young, this is her first season. She moulted in the last few days, and is now near to full size. She's using her front pair of legs and her pedipalps (aka palps) to clean off the grime left after a feed. I think the white blob is just a small pebble on her back. I hope it isn't a parasitic maggot. I guess I'll find out when I see her next. You can see her two large and four small eyes (in a line underneath her large ones) on the front of her head. Two more on top, totalling 8. You can also see bits of silk everywhere as she has woven her chosen pieces of straw, and even the living plant, into her burrow architecture. Cucumber eventually got sick of me and headed back into her burrow. You can see the pair of posterior eyes on the top of her head, giving her a total of 8. 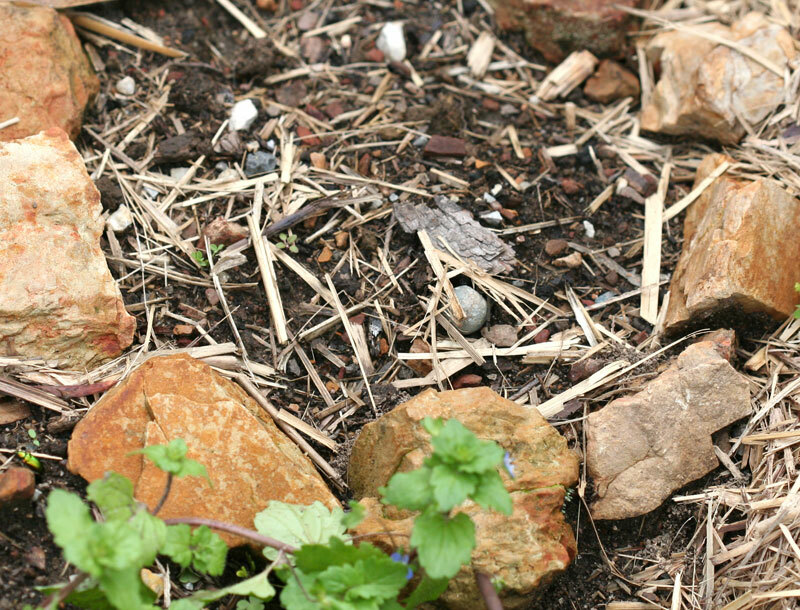 Rocky has a circle of rocks surrounding her massive burrow in the corn patch. She is in her second year, so large - about 2.5 cm in body length alone. With her long legs spread, she'd be more than double that. Rocky is extremely shy. 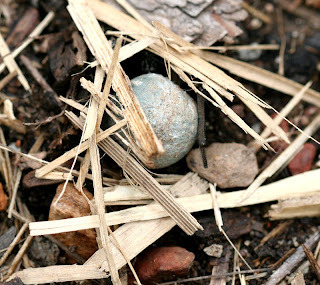 I have to start sneaking from 5 metres away for a chance of seeing any more than a fleeting glimpse of wolf spider disappearing down her burrow. She holds the egg sac in her hind legs, face down into her burrow, so her eggs can get warmth of the sun. Rocky's blueish egg sac, held by her hind legs - one visible on the right. You can also just see the spinnerets at the top also holding the egg sac. Rocky's egg sac in her rock circle. She pulled the small piece of bark over the burrow to hide it when she was making her egg sac. I haven't yet introduced you to my favourites - the black house spiders. That will have to be another blog. Gutsy - the black house - and young! I am a science writer, with 16 books published. The blog linked here relates to my passion for spiders and my book on the topic. My website acts as a blog for my research into the memory systems of non-literate cultures and the application to archaeology. My PhD looks at the way oral cultures memorise vast stores of knowledge about the natural sciences and new insights into the purpose of prehistoric monuments including Stonehenge. My 2015 academic book on the topic was published by Cambridge University Press. "The Memory Code", was published by Allen & Unwin (Australia and Pacific) in July 2016, Atlantic Books (UK and Europe) and Pegasus Books (North America) in 2017.